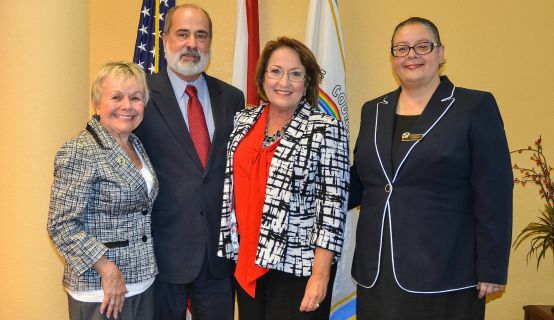 Mayor Teresa Jacobs and Orange County’s Office of Economic Development recently met with leaders of the Central Florida Brazilian American community to discuss business and tourism partner opportunities in the region. Laiz Rodrigues, president of the Central Florida Brazilian American Chamber of Commerce (CFBACC), discussed additional opportunities that could enhance and strengthen ties with the Brazilian American community, including more local events that could attract Brazilian tourists and potential new business partnerships. The mission team will bring information on the new regional branding campaign – “Orlando. You don’t know the half of it.” – to Brazil. The branding initiative is designed to boost awareness of Central Florida’s businesses and innovation assets among targeted industry leaders and site selectors to encourage economic development and job creation. The U.S. National Travel and Tourism Office named Brazil one of the top 20 tourist generating countries in the United States in 2014. Almost 770,000 guests from Brazil visited Orlando in 2013. In May, Central Florida’s tourism economy further solidified the region’s position as the No. 1 global destination with Visit Orlando’s momentous announcement of 62 million guests visiting the region in 2014. Photos from the meeting may be found on Flickr for use by the media.